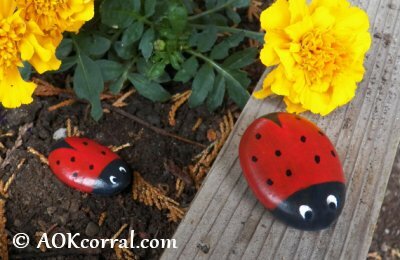 Easy ladybug painted rocks craft project for your garden or flower pots. Find some rocks for your ladybugs. Good rocks will be round or oval in shape with a flat bottom and a smooth surface. Make sure they are clean and dry. Paint your rocks black and let them dry. Paint the ladybug wings onto your rocks with red as shown in the photo. You will most likely need several coats of red paint to cover the black. Let each coat dry before adding another coat. Add small black dots on the wings. Paint white ovals for eyes onto the black head and let dry. Finish the painting with black eye centers over the part of the white and let dry. Lastly, brush the entire rock with varnish or sealer and let dry. You may want to add an additional coat for extra protection from rain and weather. Set out your little ladybug friends in your garden or in flower pots.